I still had 100 pages to read when I drove north to the Forest Lawn Branch of the Calgary Public Library to participate in a reading circle with Aboriginal Pride with 12CSI. These meetings are aptly titled, Chapters and Chat Meetings and the book up for discussion on my birthday was The Back of The Turtle by Thomas King. I poured myself a hot cup of coffee and filled my plate with fresh vegetables, fruit and dip and made myself comfortable in a circle of, this month, ten people. I was pleased to meet up with friend, Roberta, a writer I recently connected with at a Jazz event. The meetings are always full of discussion and they ground themselves in truth and honesty. Every person’s voice is heard respectfully and I find this process very powerful and helpful in my quest to understand and respect diversity in every aspect of life in contemporary society. Some of the discussions that took place, this week, included science and the silencing of scientists, reconciliation and healing and the ‘Stereotypes in Toeshoes’, and a follow-up discussion about Joseph Boyden; his writing, self-identification and the CPL session of a couple of weeks ago. A very interesting exchange of ideas. Yesterday, I finished the book, The Back of the Turtle, and thought I’d write a brief comment. In the end, I’ve decided that this is a beautiful novel…an easy read…nothing too complex and yet, lovely, for its setting and its contemporary challenges to the reader. The book moves easily back and forth between Dorian’s struggles as they unfold in the role of CEO for a BIG corporation and Gabriel’s struggles as they unfold for a ‘guilt-filled’ scientist in a formerly-idyllic and Eden-like setting named Samaritan Bay. Even the turtles have gone. Thomas King writes a novel that offers the reader inroads to a mythological place through a combination of Christian and indigenous narratives. He warms the heart with such rich characters as Soldier and Sonny. He describes an intricate and symbolic beacon of hope, eventually constructed on the beach. It is a story of optimism, in the face of utter destruction. I liked the story of The Woman Who Fell from the Sky. Donna Rosenberg has recorded anthologies of myths from all over the world. Very little is published about her biographically. I wanted to link up to a version of this myth so that my readers might enjoy. For next month, we are reading The Inconvenient Indian by the same author. I have to thank my new birder-friend, Bob, for his share of the story of Mrs. Shoveler on the Bird’s Calgary site, today. I began writing on-line in 2005. In writing to an ‘imagined’ public, I discovered a public voice. I learned to write about events that took place in my rather simple life in a way that could be explored and shared with any reader. There was a line that I refused to cross, a line that delved into the realm of the very personal. I’ve enjoyed learning to narrate my life, while reigning in my voice to a degree. In my head, I always remarked, “Only write what you feel anyone could read.” I suppose the closest I ever came to crossing that line was at the loss of my mother. I was in my father’s office, at the computer desk, the summer of her passing. 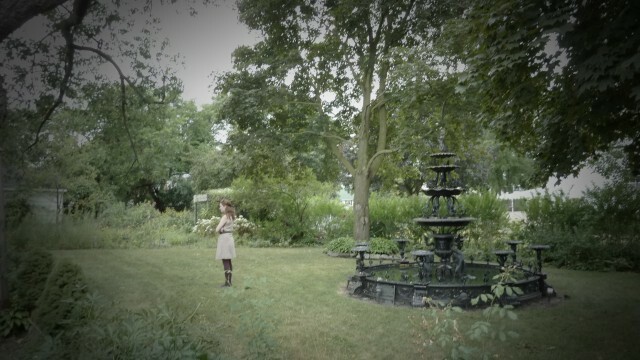 It was so bloody humid. Dad tried to keep me from opening the windows because we had to have air conditioning or we were going to melt! Whenever I would sit to write at the computer, I would secretly slide the window open to the right of me…in the night time, there was such stillness…not a breeze. I remember writing this. A lot of bloggers get weary of the process of writing after a while, but for some reason, I find the flow of evening-writing, a wonderfully relaxing practice. My initial story of Mrs. Shoveler and my effort to retrieve her from a small piece of open water achieved over 400 hits in an hour after publication. I know. I know. I don’t really have a swollen head over this. It’s not what the on-line crowd would call ‘going viral’, but, I was deeply touched that so many readers care about wildlife enough and in this case, a hen Northern Shoveler, that they would peruse the events that took place in the bitterly cold days of last December. The follow-up story, involving the re-appearance of this dear bird, sent the numbers soaring yet again. Well, today, with gratitude to Birds Calgary, more readers have visited and I’ve really enjoyed comments and messages and reactions. So, readers, thank you for all of that. This was my day…while Max and I played in snow and I met Abir again, after so long, and I made and enjoyed such a beautiful stew…while every thing was happening in my life, this is what was going on in the hum of the background. The summer of 2013, I was also staying with my father. That is the summer that India swooped into my hands and I read her. Grieving for my mother, I went deep into a couple of epic narratives, Shantaram by Gregory David Roberts and A Fine Balance by Rohinton Mistry. I immersed myself, much as I am this summer, in a lot of Al Purdy poetry and George Bowering poetry, as a way of dealing with loss and feelings that not only bubbled onto the surface, but became like open boils on my heart. To go back further, to the summer of 2011, I became captivated by Belleville and picked up everything I could that was written by Gerry Boyce, local historian (who happens to now live in my father’s building), and began stalking Susanna Moodie; visiting her house on Bridge Street west, visiting her resting place, even locating original marble at Campbell’s monuments and of course, read her writing and what others wrote about her and her sister, Catherine Parr Trail. Summers with my father have proved to be interesting literary events, every time. This summer, I brought along The Goldfinch by Donna Tarttt, a novel that every one was talking about, but one that I had not taken the time to read. In retrospect, I regret that I did not previously read The Secret History. In most reviews I find that there are comparisons being drawn between the two books and typically, The Secret History surpasses the other for its construction, originality and popularity. It’s now on my ‘to do’ list. So…my thoughts on a book that is likened, in part, to Rowling’s Harry Potter, Dickens and Breaking Bad? I guess I can only review this one through my own eyes and that’s why literary reviews can be very interesting…they are so personal. Dr. Joan Macleod’s words come to mind. “You notice what you know.” Anything you do, see or understand is coming from a prior knowledge and experience, without any intention to do so. While I may perceive some Goodreads reviews to be desperately arrogant where this novel is concerned, I can’t fault those authors because they may have been looking for something very different where a ‘good book’ is concerned. First and foremost, for me, is that ‘THE GOLDFINCH’ (the 1654 painting done by Carel Pietersz. Fabritius ) was the element (yes, it became a character for me) that I would not lose sight of throughout the novel. I fell in love with the painting at the first moment that Theo saw it through his mother’s eyes. Once described by the author, I was captivated. I would be concerned from that point forward until the end, about what was to happen to the painting, but also, what the painting had to say to me, the reader. Now, not every one would be captivated by the painting and its symbolism. I would propose that readers who have adored a piece of art in a dusty art textbook or on an art card or reproduction for years and then see it for the first time ‘in the flesh’, know what I’m talking about, here. Edgar Degas’s sculpture, The Little Dancer, is that for me. I saw the sculpture in so many forms, but until I saw it in three dimensions in the center of a room at the National Art Gallery, the first exhibit to be showcased in the new building the summer of 1988, I did not realize just how much a person can be left breathless by art. The point being that, while others are annoyed by the last fifteen pages of the novel, I was engrossed in them. An examination of the subject of the painting and its treatment was crucial to me. While many readers found the high keyed description annoying, excessive and boring, I lavished in it, likely because I’m that sort of writer. (this makes me laugh) To be honest, though, there were sections in Las Vegas where I tuned out…also, places where I found myself skimming. Did that happen for you? Some critics describe the portion of the book set in Las Vegas to be the strongest portion, but this was the section I had the most difficulty with. Not to draw comparisons, but it was the drug culture and experience in Shantaram that I found the least interesting. I find that ‘druggies’ quickly become treated as stereotypical mono-faceted characters. There isn’t anything that surprises me in the writing of their habits, their related bad choices or the consequences of those. I really didn’t care ‘how many’ pills Boris or Theo were taking…or how much vodka they were drinking. So, can you tell? This section rubbed me the wrong way. (Note that I’m trying not to ruin the story for others here, by being rather vague.) I guess we needed Vegas because we needed to know Theo’s father. Boris just rubbed me the wrong way…throughout. I wasn’t all that taken by his character, the way he was written or the seamless way that he managed to undo his past mistake. Oh my! That was all too easy and a disappointment. (no spoiler alert required…see!) READ THE BOOK. I relished everything and anything to do with the old house, the writing of Hobie and his life in the downstairs wood shop. Pour on the detail! Would this engage every reader? No. But, moi??? YES! Antiques, wood, bric-a-brac, trades, recuperation, recreation and the interesting characters who came and went in Hobie’s life. This was the ‘stuff’ of life and I think that Theo had stability in this setting. It was a relief whenever and however he landed there. Pippa was a beautiful maiden…a disappointment that the relationship didn’t feel resolved, but interesting none-the-less. My readers, here, may have already wondered about the multiple settings and the long litany of characters…well, I suppose that this is where Tartt receives most of her criticism. In the end, however, I view the book, in culmination, as a fanciful narrative about everything that is ‘us’…the traumas, the celebration, the consequences and the histories within one life. I am staying in an apartment building that overlooks a very Victorian landscape, well manicured lawns and beautifully constructed, if not ornamental, homes. I’ve met so many individuals who live here and each one comes with their own complex story. This book is like that, oodles of tales within a single character’s life time. They enter and they depart and at the end of it, we are left with the tale of a single image, an object of affection and the fact that it was something that remained, however ephemeral. A Goldfinch bound by a small tether…for a lifetime…to its own life. I recommend the book and will be looking for The Secret History. I liked this review/analysis. You might also. As my friends will know, I have a huge interest in Canadian history and in that of the world, especially where it relates to my family history. It isn’t possible to know everything well in my lifetime but, what I can do, is become a connoisseur of my own life. As a result, I am intrigued by stories of immigration coming out of the early colonization of both the Atlantic provinces and Ontario, specifically the Guelph, Elora, Fergus, Lindsay and Hamilton areas. Sometimes, mingling with the writers, artists and performers who I call my friends, I hear less than positive remarks made about the genre of writing that came out of the early 1800s and that were championed by people like Susanna Moodie and her sister, Catherine Parr Trail. Some refer to their works of observation/reporting/narrating, where it relates to living ‘in the bush’ and making observations of wilderness surroundings, as sleepers. Quite to the contrary, I find these pieces of writing, while absolutely short of drama and excitement, filled up with detail that creates a picture for me, of my own ancestors, what they must have seen and what they must have felt. I also have always liked that, out of a world made, led and meant for the male gender, it is a wonderful thing to see women who have captured the interest of society at the time, as both writers and artists. But…I digress…I really have the intention of sharing a wonderful story that sees its happy conclusion on the 8th of October.. 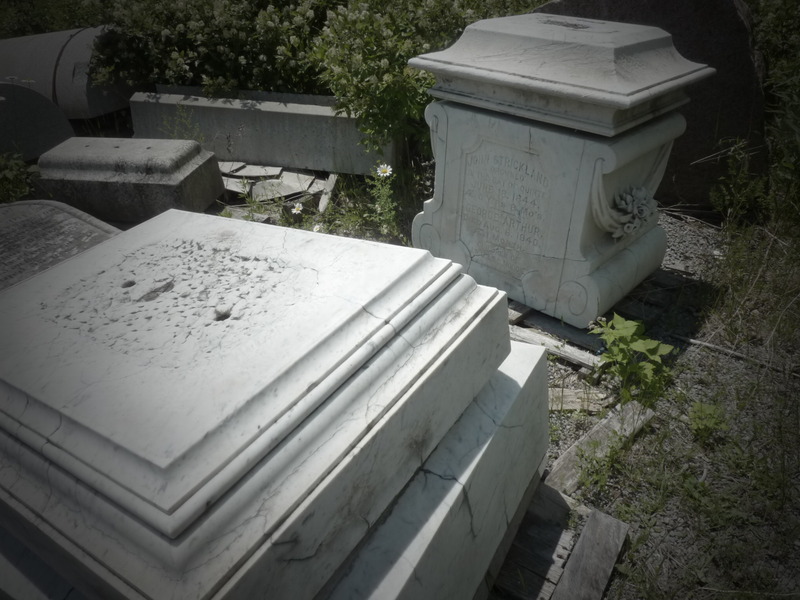 I spent a summer visiting Mom and Dad in Belleville, Ontario and took a genuine interest in exploring the city for its literature, history and art. I purchased several books ( Belleville: A Popular History by Gerry Boyce and Sisters in Two Worlds: A Visual Biography of Susanna Moodie and Catherine Parr Traill by Michael Peterman). Here are a couple of the bits that I wrote during that summer and during the summer of 2013. Encircling the neck of an Indian queen! Follows the night on her weeping way. And his glory lights up the earth and sky. And pleasure that lightens the cares of earth! I wrote at length a few summers ago about Susanna Moodie. 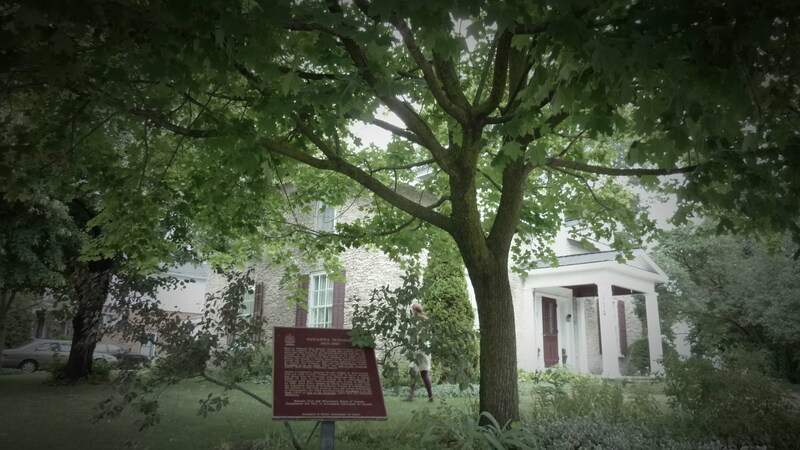 Staying on east Bridge Street in Belleville, Ontario, it only made sense then and because I have returned under sad circumstances, it also makes sense that I continue my exploration of her writing and her place in Canadian history. Recently, it just so happened that I met author and historian, Gerry Boyce, as he was doing some yard work at the front of his house. We engaged in a rich conversation about the surrounding area and the fact that he had, the day before, completed his index for another book. 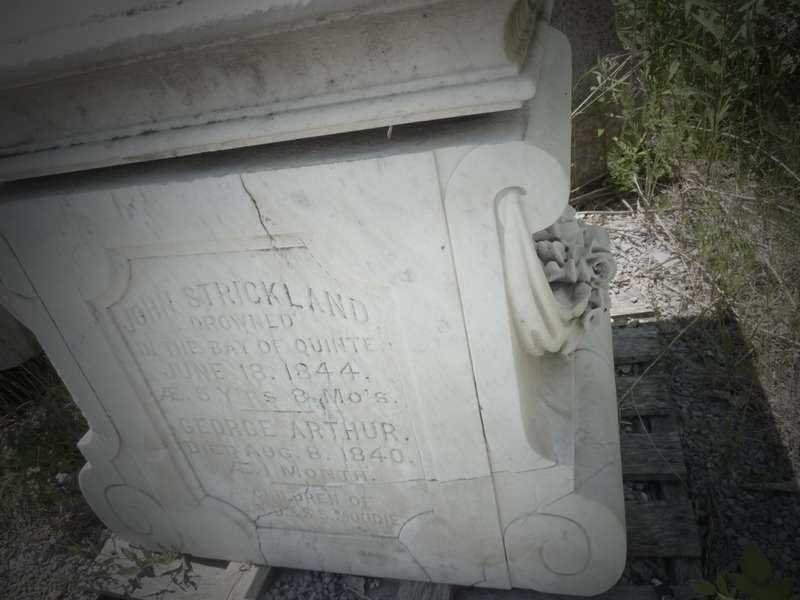 When I explained to Mr. Boyce my interest in Susanna Moodie, he went on to share with me about the refurbishments made upon her monument over the last several years. 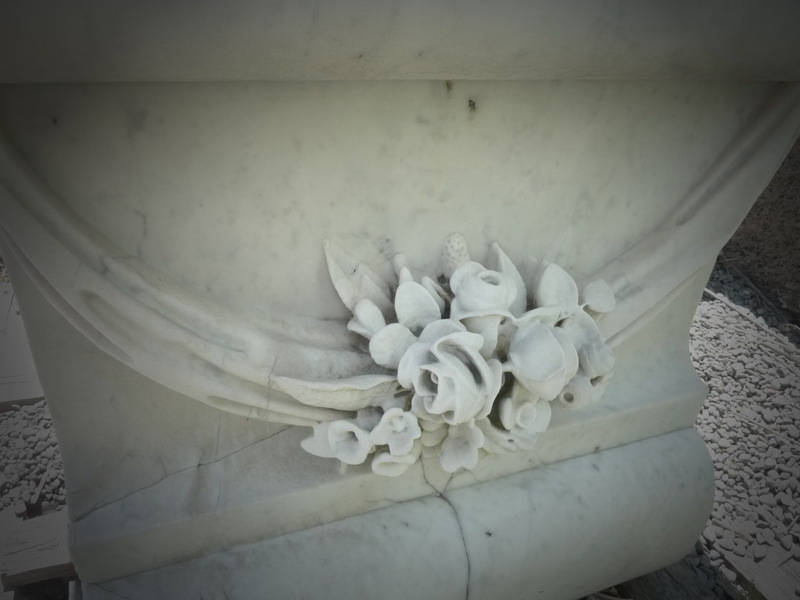 He also told me that the entire marble base had been replaced by the Campbell Monument Company and that he believed the original to be in their yard somewhere. So, yes! Of course I went to meet Gary Foster of Campbell Monuments and he and I walked out to the yard, together, to view the original monument base. Now, the thing is, this beautiful reminder of an earlier day, can not continue to exist as a discard, but rather, needs to be displayed in a place of importance somewhere in the city…perhaps at the front of the library or in a public gathering space. In whatever capacity, I hope to be a champion for this cause. I was remarkably touched to meet Gerry Boyce. He is generous in his sharing of history and I think that sort of generosity is to be admired. Daughter, Cayley and I made certain that we visited 114 Bridge Street West on July 25, 2011, right before heading south on the Via Train. This was the former cottage of Susanna Moodie and is marked as a noted historical property in the city. It was a beautiful…calming…peaceful experience. History…family…and the tree’s witness came to mind. Through all of this…and taking up the suggestion of Gary Foster of Campbell Monuments that what the monument required was a champion…I began to write letters. This is how the communications went, with the exclusion of my gushing gratitude and appreciation that, of course, wove in and out of the entire journey. I began by writing the mayor. Very soon after this, I received a note from the mayor. Kathleen: I apologize for being slow to respond to you, but it is July and we have been away a fair bit. 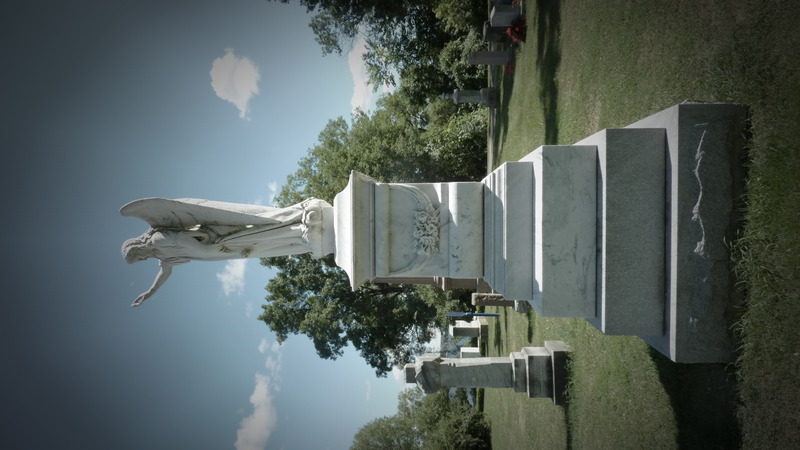 I have seen the monument and had a good talk with Gary Foster of Campbell’s Monuments. A very pleasant person! I agree fully that this monument deserves a home in a public place. It is a big piece of our local history. I am going to start talking around town with people who can help with this. Bear with me a bit and I will keep you informed of the progress. Kathleen: Over this past week I have been discussing with the directors of the Historical Society which would be the best location for the monument, both for security, beauty of location and for people to actually see it. When we come to a conclusion, we will approach the relevant authority, the owner of the location or park, and see what we can work out. You have started something….and now a lot of people are enthused. Well done! 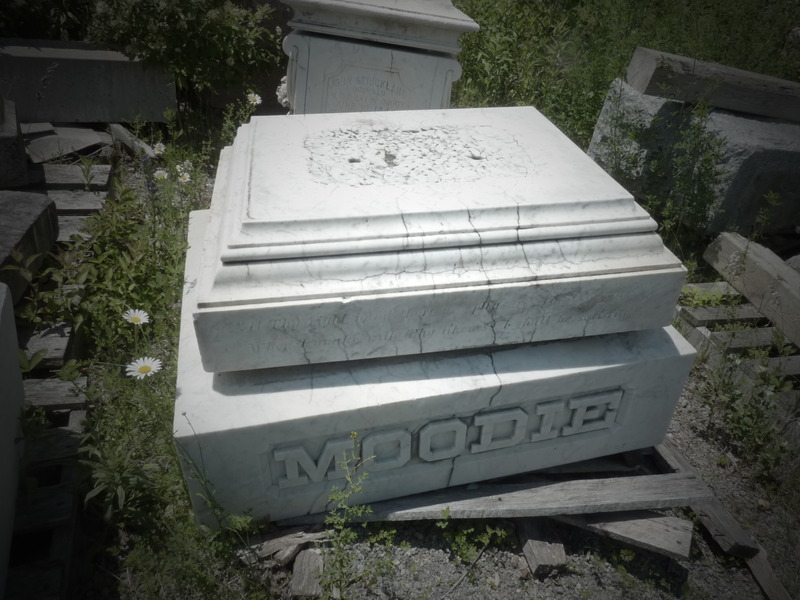 Hello Kathleen: It must seem like a long time, but your initial proposal that the Moodie Monument find a suitable home in a Belleville park is alive and well. I have met with officials of Campbells and the City and we are now all working to come up with a method that will work. As the weather is now less favourable, we will work on the project together, over the winter with a view to installing the monument in a city park location in the Spring. I will keep you informed of the progress and, of course, the outcome. Thanks for bringing this situation forward. Kathleen: On July 2, 2013 you sent an email to the mayor of Belleville, below, and he forwarded it to me “in the hope that he can respond” as the mayor put it. Well, it has been a long year but we have been – thanks to you – fabulously successful. 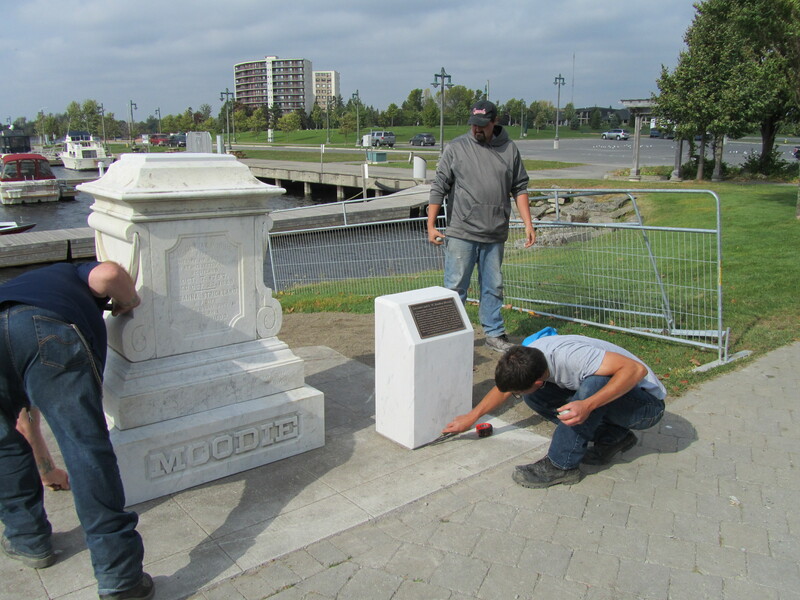 The Moodie monument has now been completely refurbished and installed just yesterday in a beautiful site along the Belleville waterfront and it will be formally unveiled on Wednesday Oct 8th at 11am by the mayor. It is simply beautiful as you will see by the picture I am sending. This was taken during the installation. You have done a wonderful service to our city and I congratulate and thank you. I am so happy for the front yard conversation I shared with historian, Gerry Boyce, while he leaned his rake against his hedge. I’ll always appreciate that Gary Foster came for a walk with me through his back lot when he really didn’t need to accommodate my unusual request on that particular day. It is such a generous gesture that Mayor Ellis should respond to my e mail personally and then pass my concern on to the Hastings County Historical Society. And finally, it has been a most treasured experience to have the project communicated to me from so far away and then to finally receive this news today from Richard Hughes. I am hoping that all of my Belleville friends will make their attendance. I know that Dad will be there.